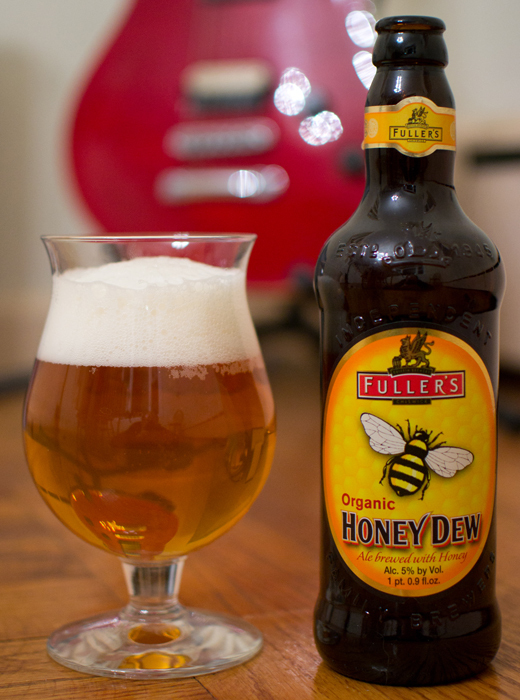 Beer #47 is Organic Honey Dew by Fuller Smith & Turner PLC (better known as Fuller’s). This brew is an English Pale Ale from none other than England. The ABV on this bad boy is 5%. It is brewed with, like we couldn’t figure this one out, honey! Organic honey that is. This beer was a nice golden honey color with a great big fluffy white head. There was quite a bit of those nice little carbonation bubbles rising to the top. I took a whiff and what do you know, honey mixed with sweet malts. Honey hit me first in the taste department followed by some sweet toasted malts. It finished on the dry side with just a bit of a hop bite. Mouthfeel…don’t you just love that word…mouthfeel or to put it in other words, how the drink felt in the mouth, mouthfeel was super smooth. It sort of coated the mouth and was a wee bit on the light side body wise. It was super easy to drink but I think one would be more than enough for most. Not a bad beer by any means just not one of the better ones I have tasted in 47 tries. “Its just a flesh wound”. I love that scene from Monty Python and the Holy Grail where King Arthur comes upon the Black Knight and an epic battle ensues. Good stuff. So when I came across this beer I had to pick it up and try it out. 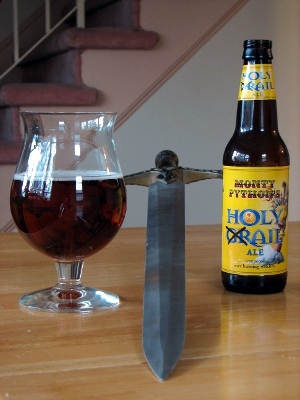 Will this beer, Monty Python’s Holy Grail Ale, live up to the movie? Lets pour and see. This brew hails from England and is was created by Black Sheep Brewery to commemorate the 30th anniversary in 1999 of the movie it is named after. This ale is an English Pale Ale with a ABV of 4.7%. A clear amber, honey colored drink awaited me in the tulip glass I poured this into. There was a small white head that remained for the entire time I drank this drink. A very nice bouquet of apples, sort of like apple cider or juice, greeted the nose. There was also some grain, bread, & malty goodness going on in the aroma also. Apples were up front in the taste followed by some bread tones. This finished very dry. Mouthfeel was really light with very light carbonation. This turned out to be a very easy drinking beer that was quite refreshing. This would make a good session beer. A session beer is one that has a low ABV that could be enjoyed multiple times in a session without getting one totally blitzed. This fits that bill perfectly. I wasn’t expecting much from this but I was pleasantly surprised.